You may not be surprised that cancer is the leading cause of death in dogs, but if you are like most dog owners, you may have never even heard of the second leading cause: gastric torsion aka dog bloat. This emergency disorder occurs when a dog’s stomach fills with air, fluid, or food, and then twists or flips on its short axis, cutting off blood supply to and from the stomach and resulting in tissue death. After the stomach has flipped, gases in the stomach will continue to expand which can place pressure on arteries, veins, and organs. Bloat, as gastric torsion is commonly referred as, is the precursor condition, before the stomach has flipped. Both instances are emergency situations that require immediate medical attention. Listed below are a few myths and the corresponding facts you should know about bloat. Bloat in dogs is also commonly known as gastric torsion or gastric dilatation and volvulus (GDV). This condition strikes fear into many dog owners, and rightly so, as it is a leading cause of canine death. It is an emergency situation, in which the dog’s stomach becomes distended and then twists on itself, causing the blood supply to be cut off. Even after the stomach has twisted it will continue to painfully expand, putting pressure on the other organs and slowing the dog’s circulation. If you suspect your dog has bloat, then he needs to be taken to a veterinary clinic immediately. However, what causes it? Are some breeds more prone to it than others? And, is there any treatment? Dog bloat is still quite a misunderstood condition for many dog owners, so in this article we will answer all these questions and clear up any myths associated with it. 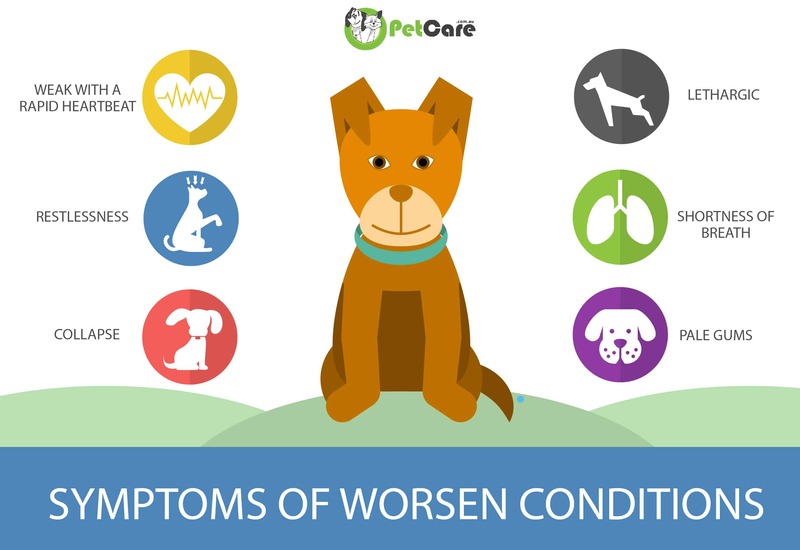 Importantly, we will show you how to recognise this deadly condition, so that you can be better informed to make the best decisions for your beloved pet. Bloat, gastric torsion and GDV are actually three slightly different conditions, but the terms are commonly used interchangeably. The term bloat is the most commonly used name with dog owners, as it describes one of the most obvious symptoms. Let’s clear up the confusion between the different terms. Bloat is a general term used to describe swelling or enlargement of a dog’s abdomen. There are actually many different reasons why a dog’s abdomen could become swollen, including obesity, pregnancy, constipation, fluid build up due to heart failure, or due to stomach bloat. When most owners talk about dog bloat, they usually mean stomach bloat, which is a large build up of gas or fluid in the stomach. This causes the stomach to fill up like a balloon, and most of the time it is very obvious, making the dog’s abdomen look much bigger than normal. It is an emergency situation, and the stomach is much more likely to twist on itself when bloated. Torsion means twisting of the stomach. In reality this can happen before or after the stomach is bloated, and can be a full or partial twist. In a partial torsion or twist, some stomach contents such as fluid, gas and food can still leave the stomach. If bloat happens first, then the distended stomach is much more likely to twist inside the abdomen. If a full torsion happens first, then the exit and entrance to the stomach becomes blocked off. This means food or fluid cannot leave the stomach and it starts to ferment, producing gas and consequently causing the stomach to expand further. The word gastric refers to the stomach, dilatation refers to the abnormal enlargement of the stomach, and volvulus describes the twisting of the stomach which causes an obstruction. In cases of GDV, the stomach expands with gas and twists on itself. GDV is a life threatening emergency for your dog, below we will discuss what happens in your dog’s body and why it is so serious. So, there are some differences in the terminology but they are all emergency situations! As the stomach swells it puts pressure on the diaphragm, making breathing more difficult. It also presses on the other internal organs and some major veins and arteries, making it difficult for the blood supply to get back to the heart, and for oxygen to get around the body. If the stomach twists, it continues to painfully expand, as the gas or fermenting fluid cannot escape. The twisting motion, also causes the blood supply to the stomach and often the spleen too, to be cut off. This means oxygen can’t get to the stomach, and waste products can’t be taken away by the blood either, causing the tissue to start to die off. The dying stomach tissue can become “leaky”, allowing bacteria and gastric fluid from the stomach to leak into the abdomen, and toxins to be released into the bloodstream. This all causes a major inflammation response from the dog’s body. The dog’s body goes into shock, as it struggles to cope with the difficulty breathing, reduced circulation and the major inflammatory response of the damaged stomach. It all sounds very serious, and it is a true emergency! The underlying cause of bloat or GDV in dogs is not fully understood. It is thought be a combination of few different things. It is most commonly seen two to three hours after a dog has eaten a large meal and many owners often report their dog ate a lot of dry food, then drank a lot of water or did some heavy exercise. The risk of GDV increases as the dog gets older, and dogs weighing more than 40kg are much more likely to suffer from this condition than smaller dogs. 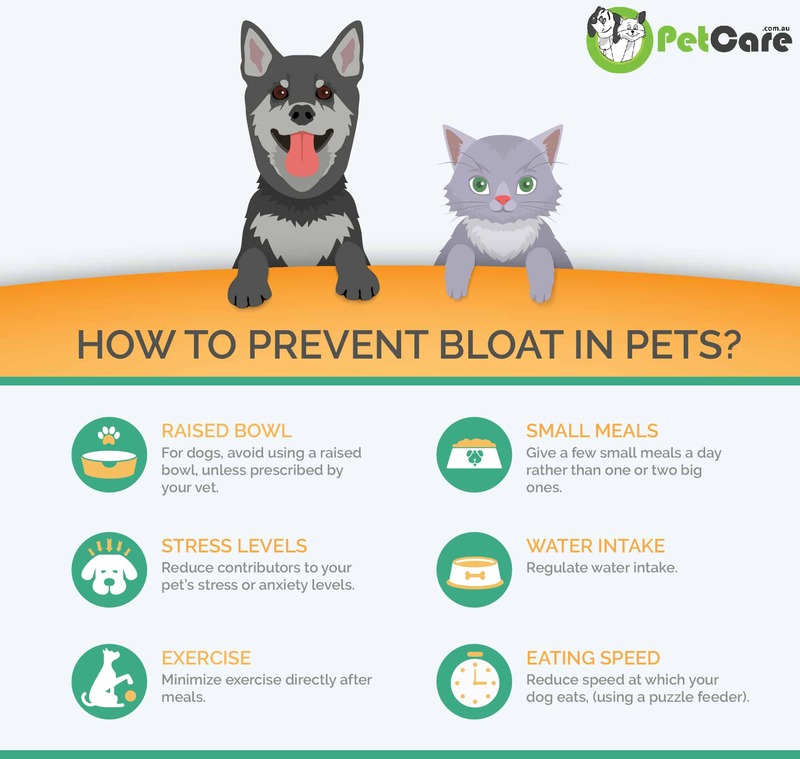 These factors are important for dog owners to consider, when trying to reduce their dog’s risk of developing bloat, which we will discuss in more detail later. Are Some Dog Breeds More Prone to it than Others? Any breed of dog can develop bloat, but there are some breeds which are more predisposed to developing it. Studies have shown that pure breed dogs are five times more likely to develop GDV than cross breed dogs. 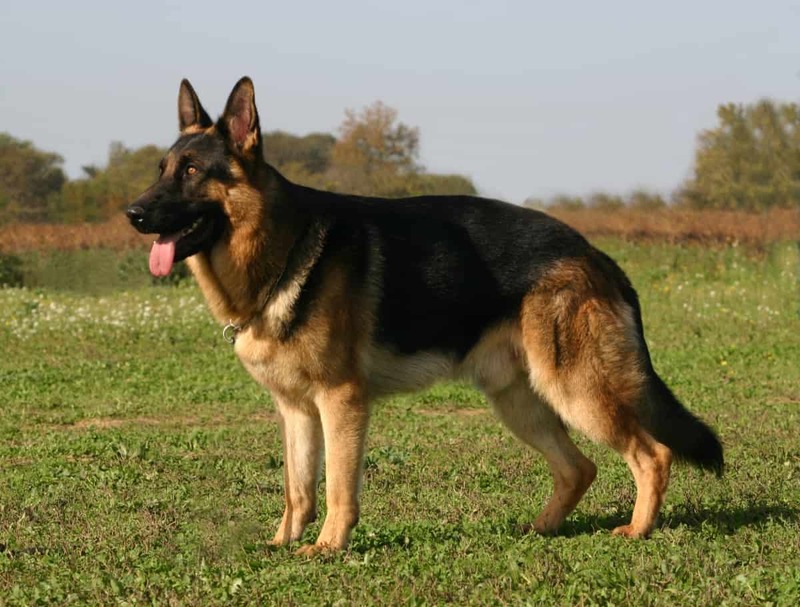 It also seems much more likely to happen to large or giant breed dogs, with a deep and narrow chest. 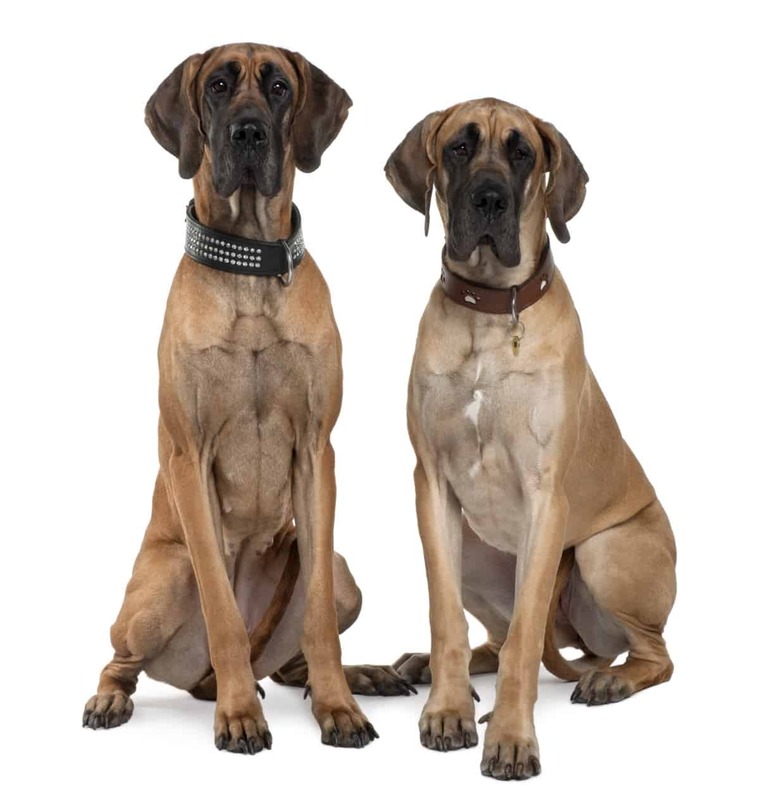 The larger dog breeds which are at highest risk of developing bloat/GDV include Great Dane, Saint Bernard, Doberman, German Shepherd and Setters. However, some studies have listed Weimaraners, Poodles and Bassett Hounds as higher risk too. 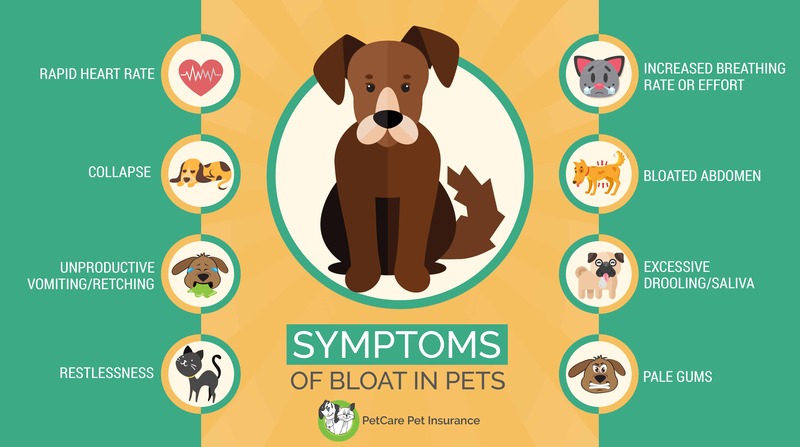 Often the symptoms of bloat in dogs come on very rapidly, that is why it is important that you know how to spot the signs and act quickly in order to help save your dog’s life. Below we will discuss the most commonly seen signs with bloat and GDV. Often this is one of the first and most obvious signs, with the dog becoming restless and pacing. The dog finds it difficult to get comfortable, and may lay down and get up often. He has this change in behaviour because he is feeling uncomfortable and painful. The swollen stomach pushes on the dog’s diaphragm, making breathing uncomfortable and more difficult than normal. When a dog is in pain, it also causes an increase in breathing rate too. The excessive drooling is thought to be in response to the dog feeling nauseous and painful. The dog feels like he needs to vomit, but cannot as the stomach is dilated and twisted. Therefore, he might do some unproductive retches, in an attempt to relieve some of the pressure inside his stomach. Often watery liquid or thick, frothy saliva is produced. This may be the first sign the owner notices, but it may not be very obvious in some breeds of dogs. This classic sign might be difficult to see if the dog is overweight or has a long coat. Often the whole abdomen will be hard and distended. Sometimes there is a large bulge just behind the ribcage. The dog may be very painful and wince if pressed on their abdomen. In the initial stage of bloat, the heart rate increases, as the dog is in pain and distress. The bloated stomach pushes on some major blood vessels, preventing blood returning to the heart. Therefore, the heart rate also increases when the dog is in shock, in an attempt to pump more blood and oxygen around the body. In the later stages of shock, the heart rate decreases lower than the normal heart rate- which is a very bad sign that the dog’s body is really struggling. The colour of a dog’s gums can give an indication of how well the body’s circulation (heart and blood vessels of the body) is functioning. Normally, most dogs have pink coloured gums. It is important to know the normal colour of your dog’s gums, so it is a good idea to check them regularly. Shock can cause the gums to go a white/pale pink colour, or even sometimes a much darker purple colour, when the heart is struggling to pump blood around the body. Unfortunately, collapse often happens late in the signs of bloat or GDV. It often means the dog is really struggling, and the condition is extremely serious. Collapse is not just a symptom of bloat; many other serious conditions can cause your dog to collapse too. However, it does indicate that your dog needs to veterinary attention immediately, whatever the underlying cause is. Some dogs that have bloat may show all of these symptoms, others may show just a few. As a dog owner, it is important that you can recognise the signs of bloat. What to Do if You Think Your Dog has Bloat? If you think your dog has bloat, then you should make your way to your veterinary clinic (or emergency night vet clinic) immediately. It is always best if you can phone the clinic to say that you are concerned your dog has bloat and that you are on your way. Therefore, they can see you straight away, have everything ready for your dog’s arrival, and start diagnosis and treatment immediately. Every minute counts with this condition. It is always good to be prepared. Ask your usual veterinarian if they offer 24 hour care, or if you have to use another emergency vet clinic at night. Therefore, it is a great idea to have your veterinary clinic’s number saved on your phone, and placed somewhere else in your home too, like on your fridge. Can You Treat Bloat at Home? Bloat/GDV definitely cannot be treated at home. There are no quick fix home remedies or supplements to make your dog feel better and relieve the build up of gas. If your dog has bloat it is a serious emergency, that requires quick and expert veterinary treatment, in order to save his life. If you try to treat your dog’s bloat at home, he will most likely suffer a lot of unnecessary pain and could die. If you suspect that your dog has bloat, and you have taken him to the veterinary clinic, what happens next? In emergency situations, everything can pass by in a blur of worry and quick fire questions, as your dog is admitted into the hospital. So, lets take a closer look at how bloat and GDV are actually diagnosed. Bloat can be suspected based on the dog’s symptoms and clinical physical examination. The veterinarian will complete a physical examination of the dog, checking things like the colour of it’s gums, heart rate, breathing rate, abdominal palpation and temperature. X-rays are taken to confirm the bloat or GDV. These allow the vet to check the position of the stomach, if there is dilation (bloat) and if the stomach is twisted too (GDV). Blood tests are completed to check changes in the body such as dehydration, white blood cell level, levels of salts and the acid-base balance, as these can all be life threatening if not quickly corrected. Treatment varies depending if the dog’s stomach has only dilated or if it has twisted (GDV) too. Surgical intervention is the only option to untwist the stomach, and try to save the dog’s life. Some dogs may need immediate surgery, while others will benefit from a period of stabilisation before surgery is performed. The surgery is risky, but it is the only option to try to save the dog’s life. The dog will be given intravenous fluids in large volumes to help treat the shock, dehydration and improve his circulation. Pain relief is given to make the dog feel more comfortable. Antibiotics are administered, as there is a big risk of infection. A stomach tube may be passed to help relieve the build up of gas in the bloated stomach. If the stomach has fully twisted it is not possible to pass a tube, as the entrance is totally blocked. Sometimes the stomach may be decompressed (let some gas out) by carefully inserting a large needle through the dog’s skin where the stomach is bulging on the outside. A general anaesthetic and surgery is required to untwist the stomach and return it to the normal position. The stomach and spleen are checked for signs of damage or areas of dead or devitalised tissue due to lack of blood supply. If the stomach has twisted a gastropexy procedure is performed. This procedure involves stitching the stomach to the body wall, to hold it in the correct position and prevent it from twisting again in the future. The dog will require intensive hospitalisation, with intravenous fluids, medications, pain relief and regular blood tests. Usually there will be repeat x-rays or ultrasound procedures to check the stomach after the surgery. Various other tests such as electrocardiogram (ECG) will also be performed to check for heart irregularities. What is the Prognosis for a Dog with Bloat/GDV? Bloat/GDV is often a fatal condition. Many dogs are euthanized due to lack of owner funds or die before treatment can be given. The quicker the dog receives emergency veterinary care, the better the chance of survival. Surgery is required to treat and save the dog’s life. The surgery is risky, but many dogs do survive and go on to live perfectly normal lives again. The survival rates for dogs that undergo surgery varies widely. With aggressive medical and surgical treatment, mortality rates can be as low as 15 to 24%. The intensive treatment, surgery and hospitalisation is expensive. It is always a good idea to have insurance for your dog, especially as it might need expensive emergency surgery to save its life. How Can I Prevent My Dog from Getting Bloat? Unfortunately, there is no fail safe method to prevent your dog from getting bloat. Encourage your dog to eat slowly, by feeding him alone if he is competitive with other dogs around, or using a puzzle feeder if necessary. Feed your dog 2-3 smaller meals throughout the day, instead of one large one. Never feed your dog when he is panting excessively, such as after exercise or if he is too nervous or excited. Keep your dog at a healthy weight for his breed. If your dog is nervous or fearful, try to reduce his stress or seek advice from a certified canine behaviorist. Talk to your vet about the gastropexy surgical procedure, especially if your dog is a larger breed or has suffered from a previous episode of bloat. This can sometimes be done as a preventive measure, in some dogs that are deemed at high risk of developing a GDV. Although the gastropexy surgery doesn’t prevent the stomach from becoming bloated, it prevents it from twisting. Dog bloat is a serious emergency condition where by the stomach becomes painfully distended. It often involves the stomach twisting on itself, as is the case in GDV. This leads to difficulty breathing, reduced blood circulation leading to shock and the blood supply to the stomach being cut off. Although any dog can develop this condition, older, larger, pure breed dogs are at a much higher risk. 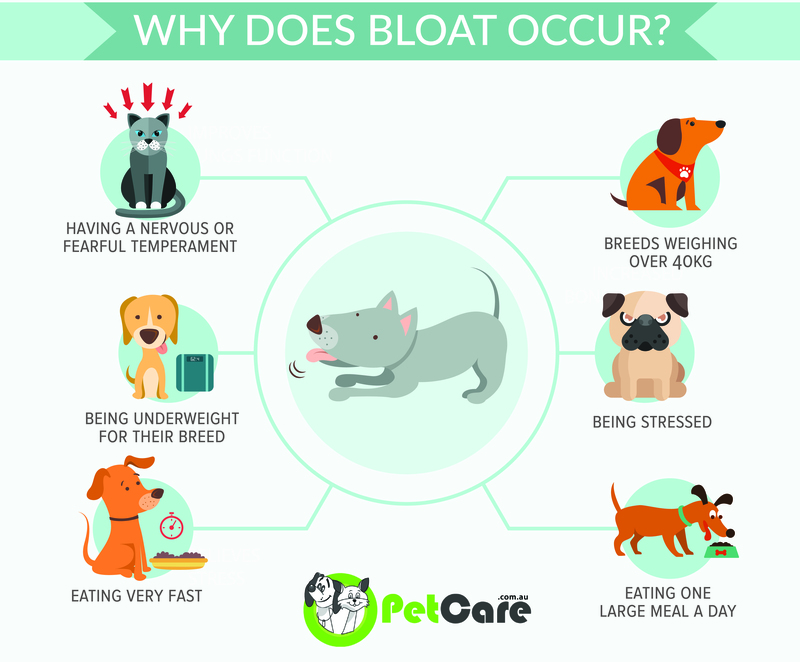 All dog owners should be aware of the symptoms of bloat, and know that they need to take their dog to a veterinary clinic immediately. Unfortunately, many dogs are euthanized or die from this terrible condition. Intensive medical and surgical treatment can save the dog’s life, but the sooner the dog receives treatment the better the prognosis. Every minute counts, with dog bloat. Therefore, if you are in doubt whether your dog is showing signs of bloat, it is always best to seek veterinary attention sooner rather than later. Glickman, L. T, Glickman, N. W, Schellenberg, D. B, Simpson, K., Lantz G. C. (1997) Multiple risk factors for the gastric dilatation-volvulus syndrome in dogs: a practitioner/owner case-control study. J Am Anim Hosp Assoc. 1997 May-Jun;33(3):197-204. Brockman, D. J, Washabau, R. J, Drobatz, K. L. (1995) Canine gastric dilatation/volvulus syndrome in a veterinary critical care unit: 295 cases (1986–1992). J Am Vet Med Assoc 1995; 207:460–464. Glickman, L. T, Lantz, G. C, Schellenberg, D. B, et al. (1998) A prospective study of survival and recurrence following the acute gastric dilatation-volvulus syndrome in 136 dogs. J Am Anim Hosp Assoc 1998;34:253–259. I worked for 8 years at a major animal shelter looking after the dog boarding section. We had a rule that dogs were to be separated between eating and exercise for 1 house. In the 8 years I worked there, there were about 3 instances of gastric torsion. Never had it with small dogs but realise there is not enough known re the cause. It is a medical emergency !